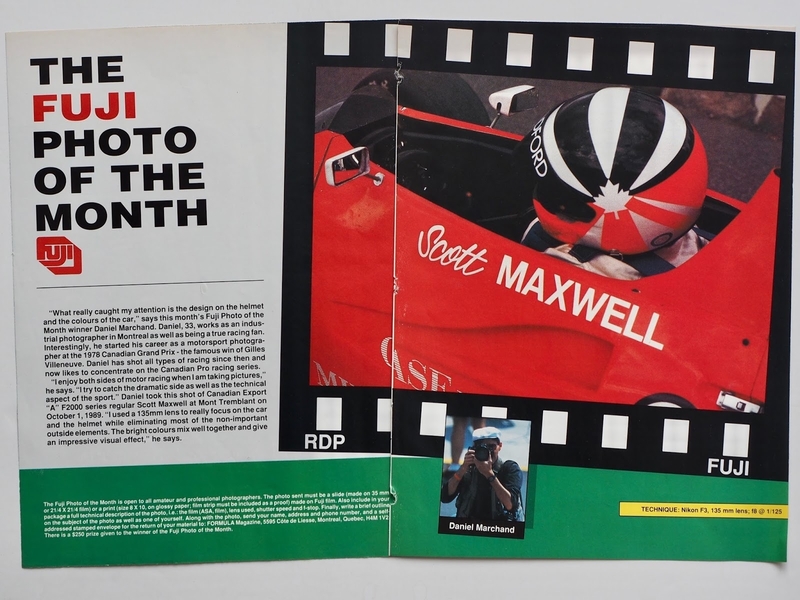 Please note that most of the pictures illustrating in this article are scanned from the original publications or past archives and were taken by the auteur during that period of 1987-2001. Sorry﻿for the very va﻿riable image quality since almost all my original slides have been lost or destroyed. Many people that I have known during my active fifteen years in motorsport photography were very curious about the "glamour" side of the job (assignment). But .... almost all of us (mainly men along with a few courageous women) were mainly motorsport fanatics that are loving at first auto racing and ... were dreaming to be themselves real racers. So, doing photography was may be one of the nearest ways to be involved in the sport. At that time period (1987-2001) auto racing was still a dangerous sport with frequent accidents, injuries and time to time deaths even into the smaller and local series. Race track organizations and installations were most of the time on the minimal side and security manners were crude compare to what we see today (which are almost clinically controlled). 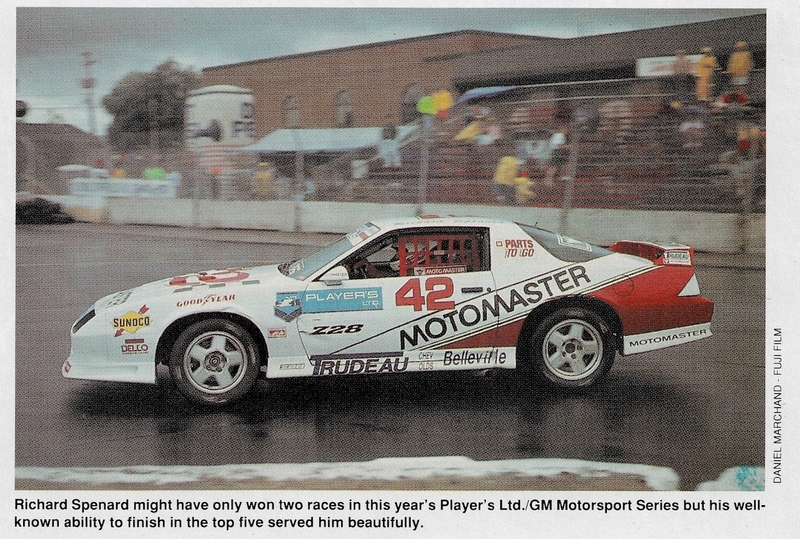 A﻿nd most of us (speaking of the regulars) who were covering the whole season were freelancers often attached to the few different Canadian auto-sport publications. The search of the required credential to get free access to the site was the primary task to fulfil. In our small community of fellow’s car racing photo takers who were able to see a mix of old timers, ambitious, groupies and beginners. Sometimes we had the visit of some newspapers correspondents which were notorious for their lack of experience in that domain. 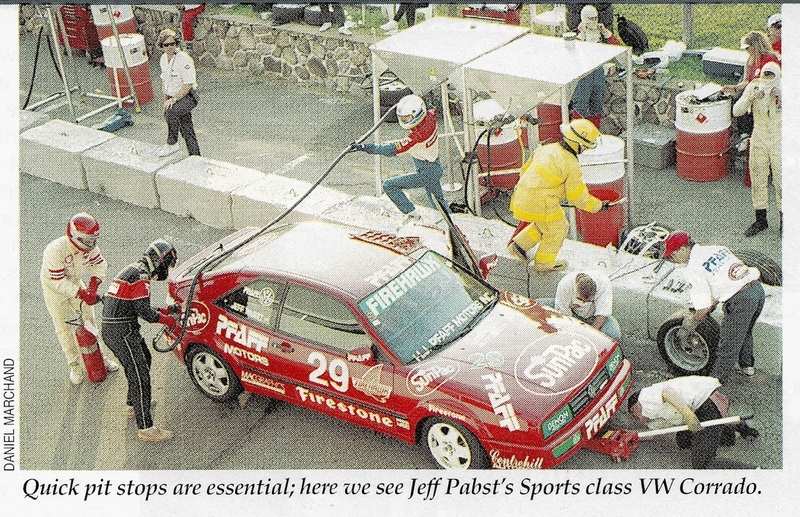 Because doing auto racing pictures is not really an easy task. It requires dedication, physical effort (most of the time for moving yourself to strategic places or simply anticipate and follow the action), good reflexes, a good sense of the environmental movement, an interpersonal involvement, persistence, to be highly auto-critical of your work, the capacity of fast learning, etc., etc.. At the end﻿ you have to remember in this nasty (translate by "competitive") world of communication that only results are counting. And what about equipment? Sorry but my little experience in that field have teach me that racing photo editors don’t give a damn of which camera or system you are actually using to do your work. But I can understand the amateurs when they are saying they cannot really make good pictures like the other fellows on the other side of the fence because they don’t have the right equipment and ... the necessary access credential. I﻿ have enjoyed all the time I was part of that special group of colleagues. Sure I have encountered some difficult working situations like conflicts with officials or very adverse weather conditions (sun, rain, wind, cold, snow!) or very emotional disturbances or simply bad photo output after all these efforts. Many times we were staying at cheap motels (Rooms shared by 4-5 of us!) or in a tent or even in a car and we were eating scarcely at sponsored tents if it was possible or at infamous snack bars. We were begging for taxiing around the circuit from the different teams or circuit workers. And don’t forget we had to bring this fabulous but annoying 20-25 pounds camera bag filled with few cameras bodies, 4-5 lenses, electronic flash, exposure meter, film rolls, without forgetting the monopod for that heavy extra telephoto "dream" lens (a 300mm telephoto lens). Drinking water was another priority to be addressed for surviving around the circuit. Clothing was also an imperative to be consider. At the end you really looked as a war correspondent. And there is a lot of noise (ear plugs were a must!) surrounding you. But during the races we finally all had this adrenalin rush to perform our "duty". No time to think or postpone anything because the action was taking it all. At the end of race day program, we were totally exhausted but really proud to be part of that special group of auto racing passionate photographers. All my thanks goes for Formula, the Canadian auto sport magazine; Pole-Position magazine; World of Wheels, Canada's auto magazine; Le Monde de l'Auto, le magazine québécois de l'automobile; Canadian Grand Prix program and to all my photo editors (Thanks to Marc, Luc, René, Philippe among all others) who have believe in my work. 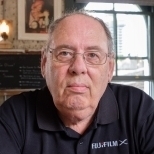 A special thank also to my occasional sponsor Fujifilm Canada. 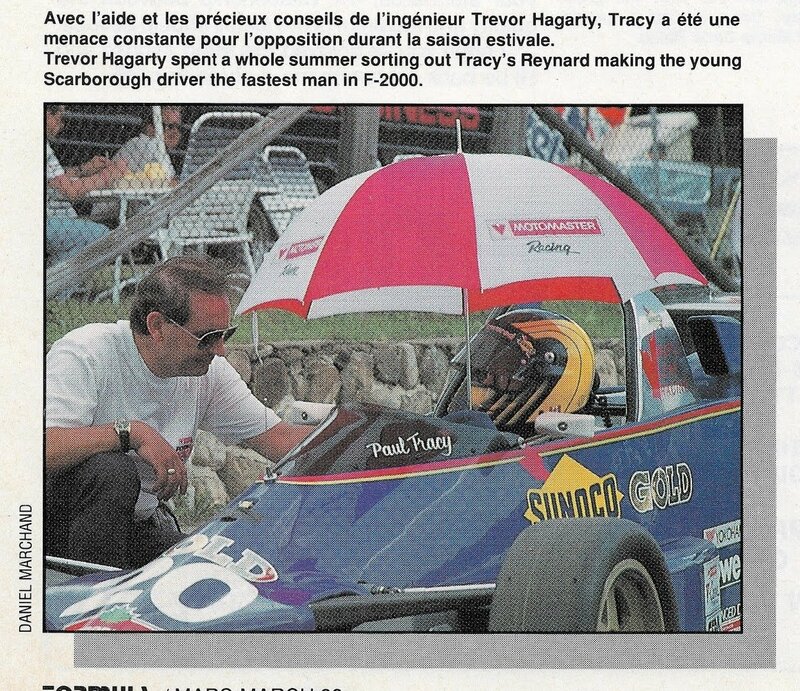 Jimmy Vasser: An American in Canada! 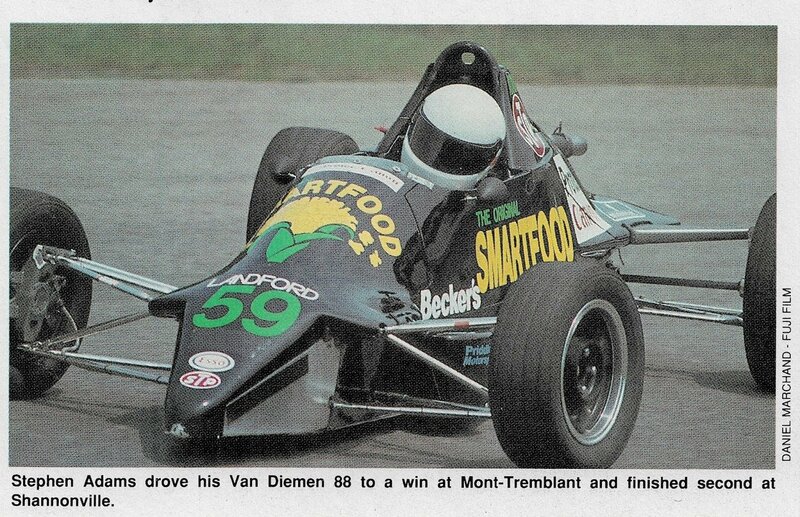 For a time, Jimmy Vasser did his basic open wheels racing classes in the Canadian Formula 2000 racing circuit before graduating into USA racing circuits. 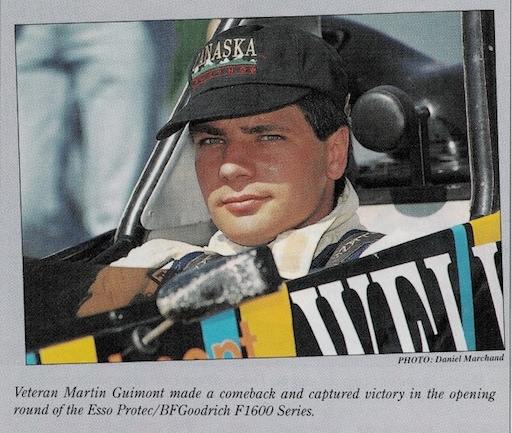 Vasser is the last American born driver to win a Cart championship in 1996. 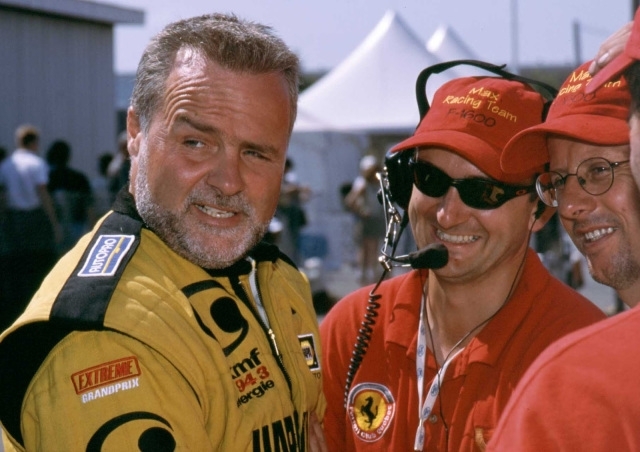 He became eventually a successful Indy racing team owner. 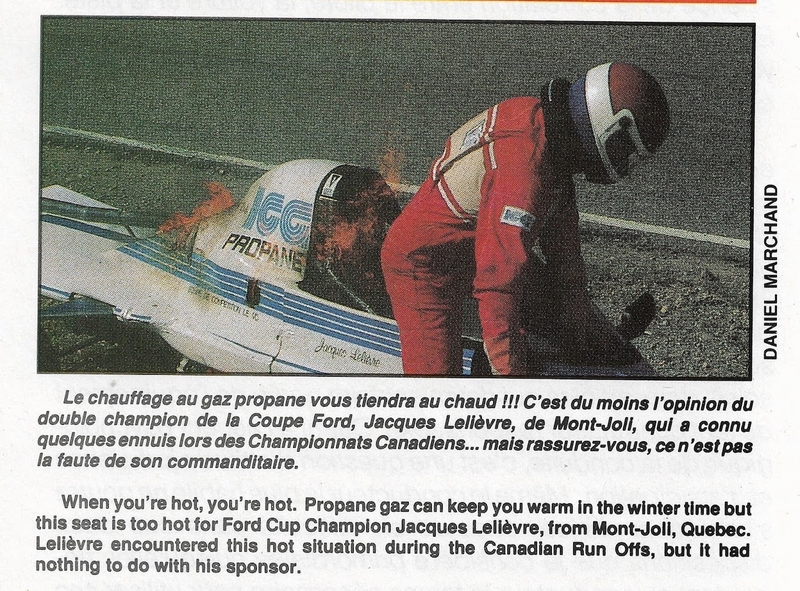 Stéphane Proulx: The gifted but uncontrollable Canadian young telegenic champion. The destiny has crushed one of the most talented auto racer of his generation. 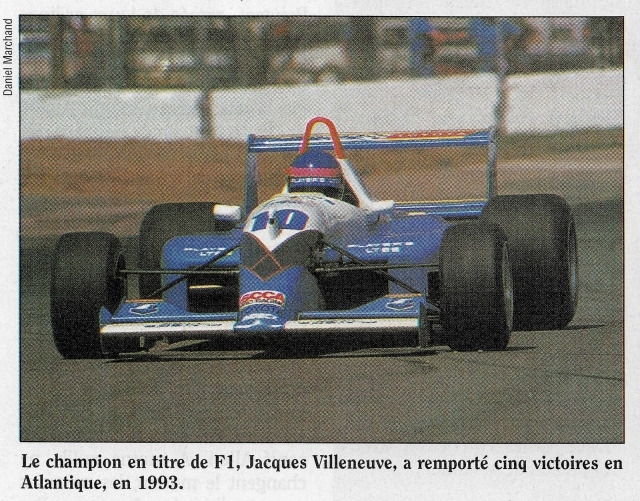 He was "mediatic" before the hour and before Jacques Villeneuve (son of Gilles). At a time, everybody wanted to be near him but finally almost everybody ignored him at the last moments of his very short life. But he was so a dashing personality even after knowing the complete story. 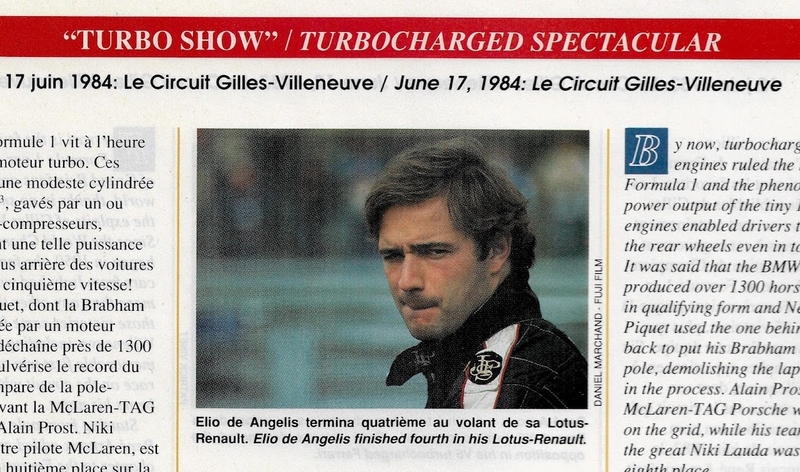 Elio de Angelis: This portrait snap shot have been taken in 1984 at the Canadian Grand Prix. At that time Elio de Angelis was driving for the Lotus team of Colin Chapman. He will be the last driver to win a Grand Prix race for Chapman (before his death). 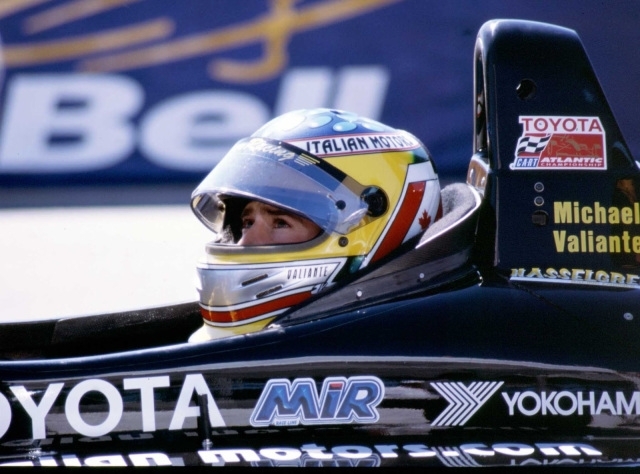 Then, de Angelis changed team for Brabham where he lost his life during a private test. Rain (and cold!) 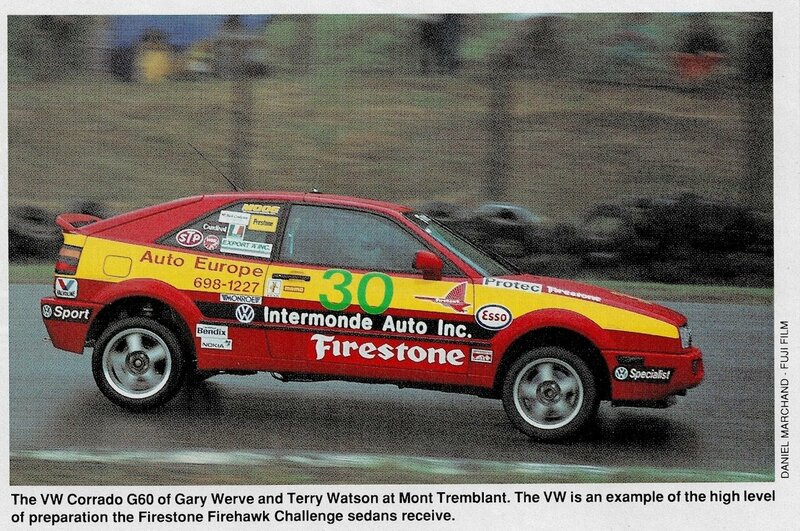 around the circuit: Mont Tremblant mountain circuit is reckoned for its rapid change of weather during a race weekend. During this particular event the light was so low that I have to rely on electronic flash aid and for this reason I have position myself to take side picture of the cars preventing that way to disturb the drivers. 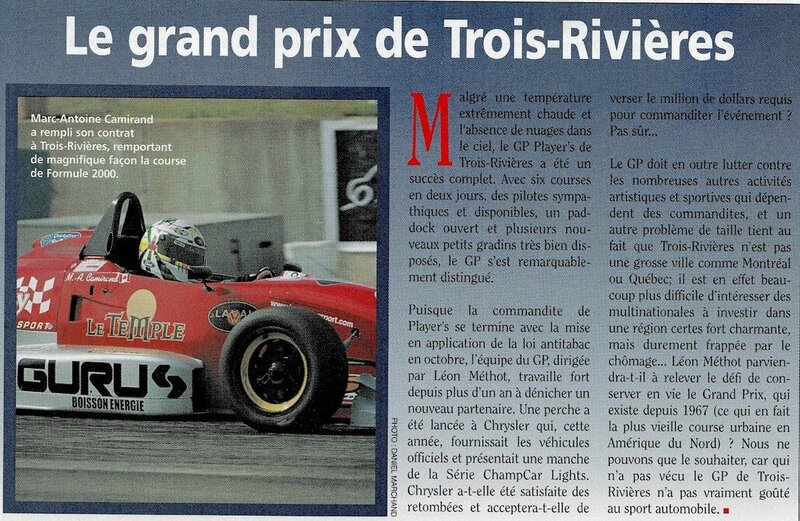 Another rainy picture shooting with the "King" Richard Spénard at the Trois-Rivières Grand Prix. Spénard was one of the most experimented Canadian racing drivers of its time. I was talented but also a very generous fellow racing teacher. 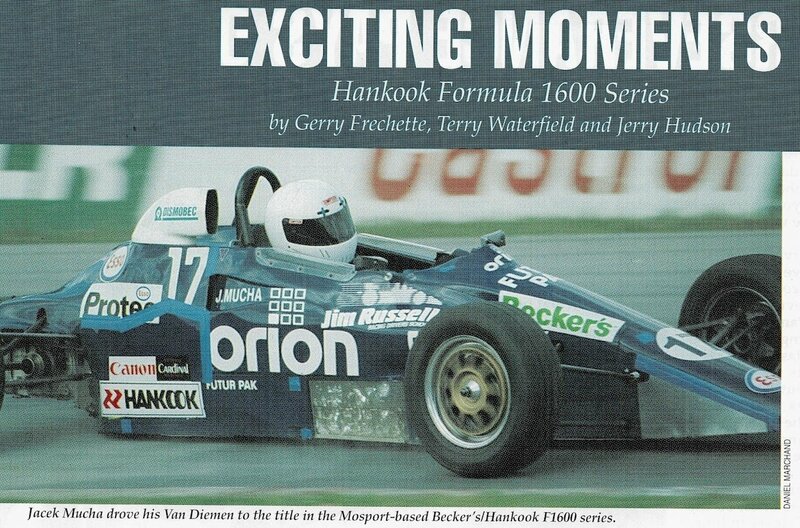 Greg Moore: Another Canadian sensation young racer that everybody was hoping the best. 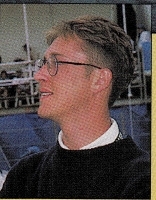 His short live ended during a Cart Championship race at Fontana, California in 1999. 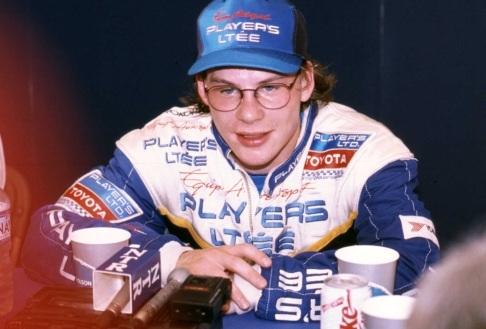 Jacques Villeneuve (Jr): He may be the best Canadian racing driver who was able to win the Indianapolis 500 race, the Cart championship and the Formula 1 Grand Prix season championship (against Michael Schumacher among others) in only three years’ time! He was certainly gifted as a natural driver, but he was also very clever. And he has a charming attitude toward press and photograph people. 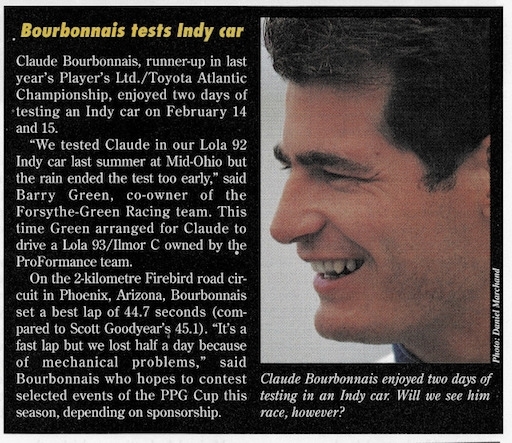 He can be also a very independent guy that may have affected negatively in the last part of his racing career. 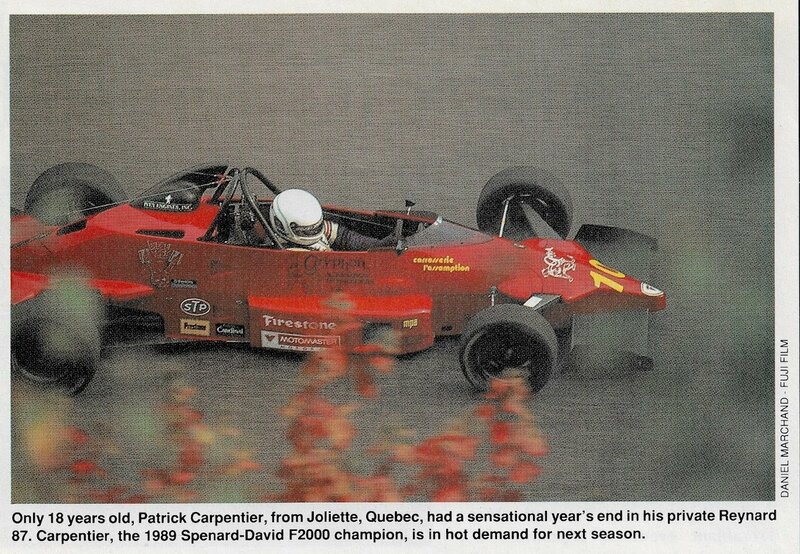 Patrick Carpentier, the next "Villeneuve"? Hopes were high right from the start. 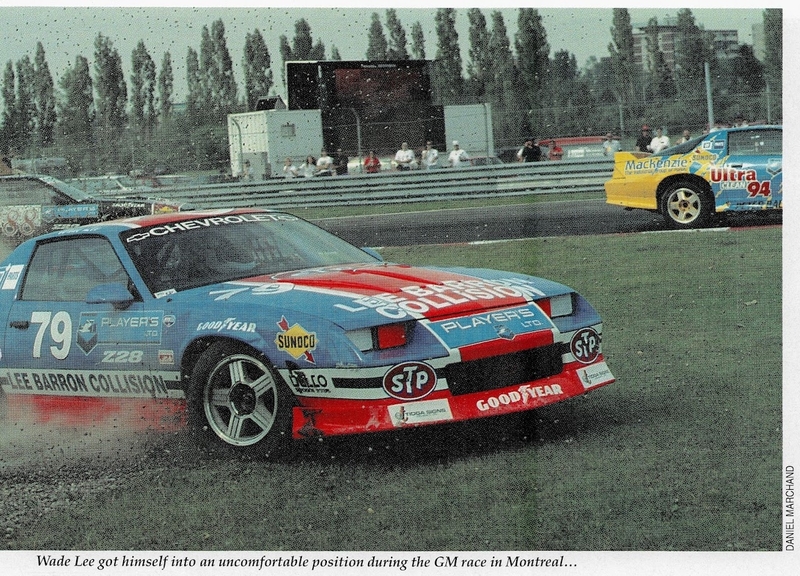 Carpentier manage to make a professional racer living in the USA before becoming a tv commentator and an enthusiasm race ambassador in Canada. Isabelle Roy leading a front pack of astonished guys! My last published racing picture in November 2001: Certainly not my best one but in some way, it announced that change has to occur into the auto racing world if they want to survive. The introduction of women in the sport has to be a real changing factor but seventeen years later it still has to be seen as a general evolution. A special thanks for all the people who have supported me along these years of freelance motorsport photography and more specially to my wife Manon who has understood and encourage my passion for this sport. And a special thanks to Dallas who patiently has worked a lot to reconfigure this article! Great article, Daniel! Thanks for publishing here in FZ. I used to be a really big fan of F1 through the 90's and early 00's and then I also photographed the A1GP series when it came to my city in 2006-2008. The other day I watched the documentary Senna, which I found really interesting because it covered the period just before I became interested in F1. I hadn't been a Senna fan, but having seen the film about him I think I would definitely have enjoyed supporting him. 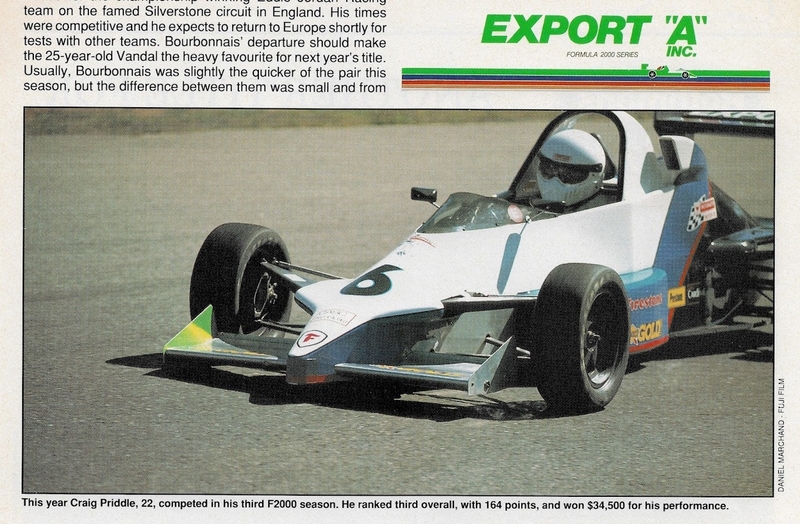 I was initially a Schumacher fan when he raced for Bennetton, but the Ferrari years I didn't enjoy him at all and my allegiance was with McLaren, particularly the Finnish drivers Mika Hakkinen and of course Kimi Raikkonen. Thank you for your nice appreciation. 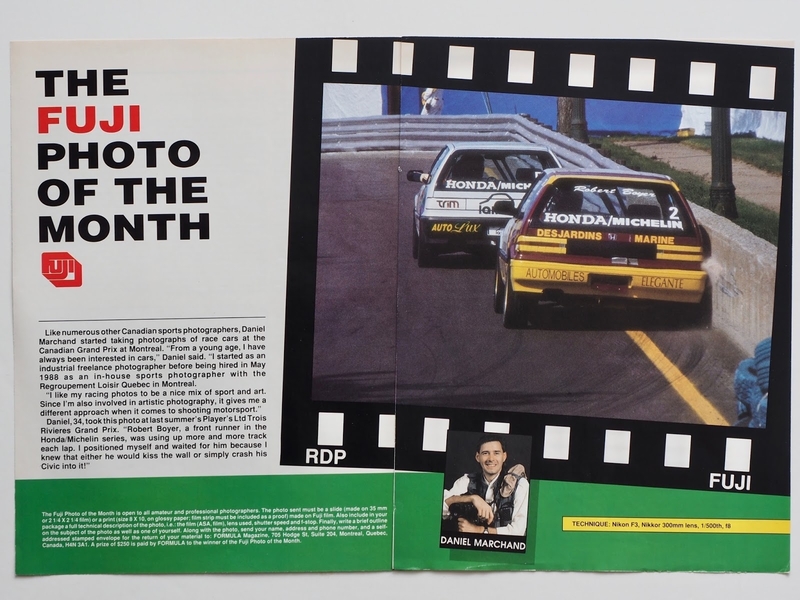 Motor-racing photography have always been a big challenge that require a lot of dedication. But it can be very rewarding if you really persist in your effort to get satisfactory results. My first real Formula 1 souvenir has occur at the dead of Jim Clark in January 1968 during a Formula 2 race in Germany (I was a youngster at the time!). But like you I really start to enjoy following the series with the arrival of Gilles Villeneuve (father of Jacques Jr) in 1977-1978. The racing conditions have now evolute in a way that fans and local photographers are contained in far stands and are not allowed to be in very close contact with the racing participants. The races are by far less risky and all the circuits have been much standardized. For your amusement I have found a front cover I have done for Pole Position magazine showing Michael Schumacher in its Benetton racing car at the Montreal Canadian Grand Prix. I was born in January '68 so my F1 awareness might have been a little cloudy then! In South Africa we only got television in 1976 and then IIRC the SABC only used to cover the local GP. I recall witnessing the terrible death of Tom Pryce and the fire marshal at Kyalami in the '77 SA GP, which they seemed to show repeatedly in slow motion. 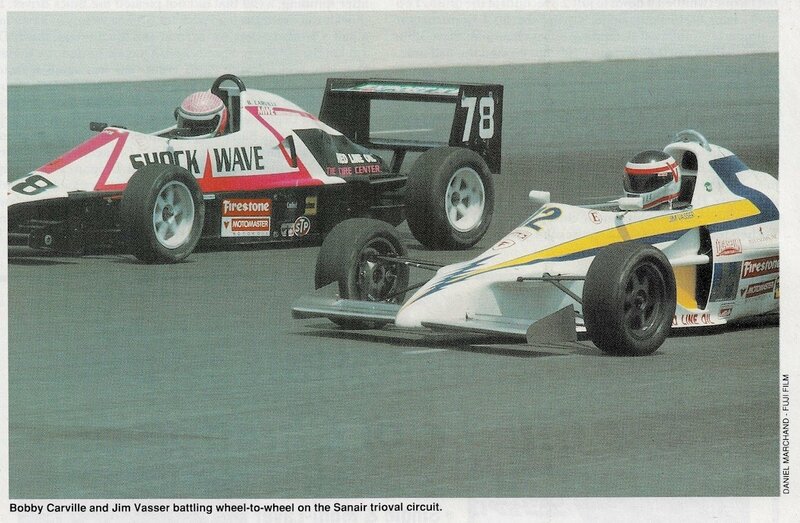 In the 80's they started to show more races on local TV and my Dad was a huge fan of Nigel Mansell back in those days. 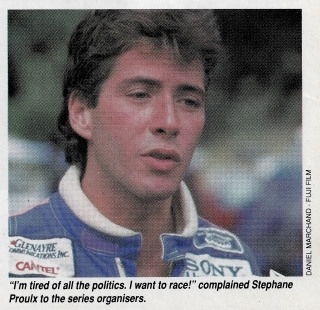 My interest, as mentioned, only really began in about '94, the year Senna was killed. I saw that there is a series about F1 now on Netflix so I watched the first episode last night (was around last year's season) and it takes you behind the scenes. The cars now look rather silly with those halo things around the cockpit, in my opinion. @Chris Fabbri has also covered a few F1 races in Brazil. We had the same problem in Canada with the only live TV coverage during the Canadian Grand Prix but we use to look on BBC coverage rediffuse very late sunday night by the CBC (Canadian Broadcast Corporation). Back in 1968 I have the chance to have seen the excellent John Frankenheimer movie Grand Prix which its photography and cinematography has been very inspiring through times. For sure as Canadians we were following the meteorical ascension of late Gilles Villeneuve and later on of his very talented son Jacques Jr. 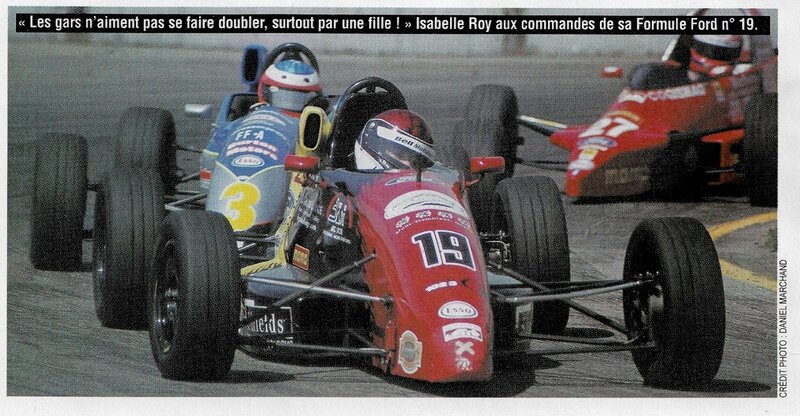 But too of my favorite pilots at the time were Keke Rosberg and Nigel Mansell. But I must add that except for very few of them we like to follow the careers of all the F1 pilots of the time. It was like big family. We love also to follow the car concepters like Gordon Murray or Gérard Ducarouge. I can understand your comments about the noise. F1 is in Melbourne this weekend and I could hear the GT3 cars at a distance of about 7 km yesterday morning. Glad I didn't need to work over the weekend as my office is even closer. And don't mention the traffic disruption - if I take the car to work my normal route is through Albert Park! You can try through the "Headliners" link presented on the Home page. It should work better. If not I will try to configure the pictures via another option. 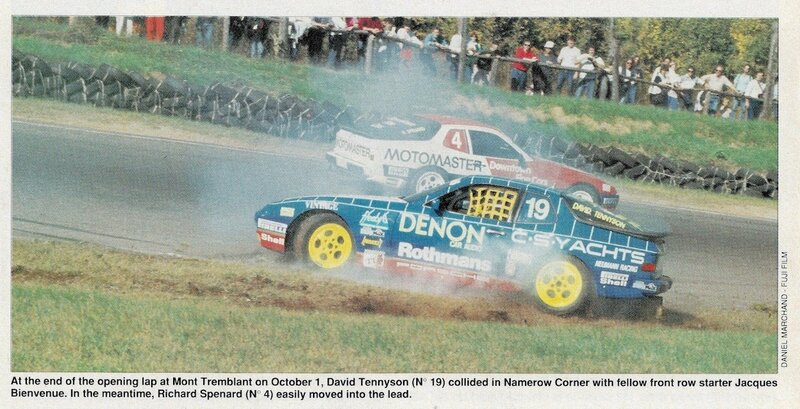 Yes by today's standard the noise level of motorsport events are considered more as a pollution than an annoyance. On a long run the Formula E (electric) should be the real modern evolution of car racing but there is still a very strong (and machismo?) resistance. I hope everything is returning to normal at your place. I have re-uploaded all the pictures (except one). I hope that will fix the problem. Have a good day. Interesting series. 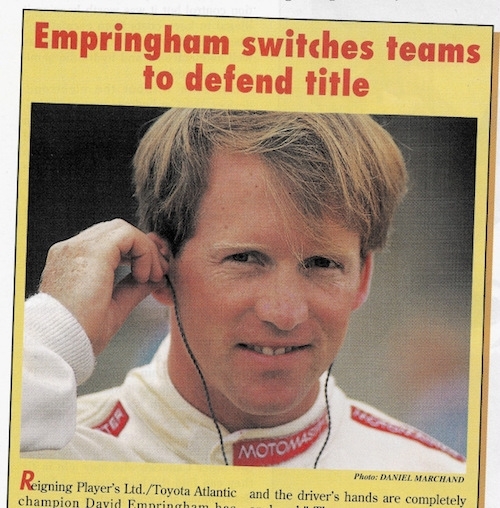 Several drivers that I remember. Thank you for encouragement. It is pleasant to share some mutual memories.